Mary (Williams) Fredericks, 81, of Palmerton, formerly of Coaldale, died Friday in Palmerton. She was the widow of Norman H. Fredericks, who died in 1996. A registered nurse, she was last employed at the former Coaldale State General Hospital for over 30 years, last working in the emergency room. Born in Coaldale, she was a daughter of the late Edward and Mari (Harris) Williams. She was a member of First Congregational Church, Coaldale, where she served on the board of trustees, sang in the choir and was secretary for the women's class. 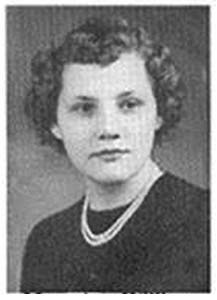 A 1949 graduate of the former Coaldale High School, she also graduated from the Pottsville Hospital School of Nursing. She was also a member of the Retired Nurses Lunch Bunch, the Pottsville Hospital School of Nursing Alumni Association and the Coaldale American Legion Auxiliary. Surviving are two daughters, Bronwyn "Bonnie," wife of William Scheutrumpf of Coaldale, and Mary Ann, wife of Kevin Markley of Palmerton; five grandchildren, Amanda Ogozalek, Teddy Allen Fredericks, Lindsay Sherrington, Matthew Veron and Malinda Veron; three great grandchildren, Delilah Brode, Dakota Brode and Logan Ogozalek; one brother, John "Jackie" Williams and his wife, Pat, of Lake Hauto; one sister, Megan Reichelderfer of Lake Hauto. She was also preceded in death by a son, Edward Fredericks; a brother, Edward Williams; and a sister, Dorothy Paquette. Service: 11 a.m., Tuesday, First Congregational Church, Coaldale, with the Rev. Dr. Wayne Benack officiating. Interment, Sky View Memorial Park, Hometown. Call 6-9 p.m., Monday, Gulla Funeral Home, 130 E. Ridge St., Coaldale, or 10-11 a.m., Tuesday, in the church. Memorials in her name may be made to the church, c/o Lois Richards, 46 E. Phillips St., Coaldale, PA 18218 or St. Luke's VNA Hospice, 1510 Valley Center Parkway, Suite 200, Bethlehem, PA. 18017.